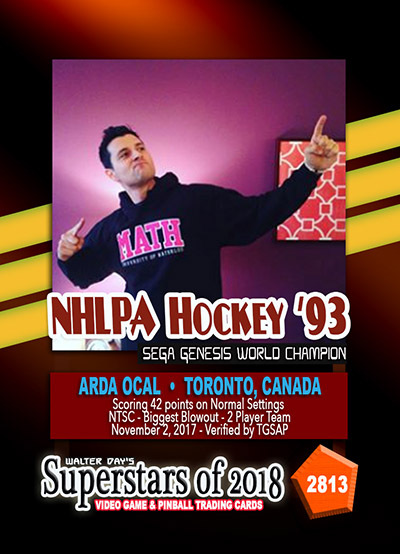 Our next Trading Card Spotlight features Arda Ocal who is displayed on card number 2813, from the Superstars of 2018 Collection. Arda is a broadcaster whose resume includes ESPN, NHL, WWE, MSG Network and many more. From being the weather reporter or a report for championship games, Arda has been all over. An avid Video Game fanatic, he hosted and participated in the 2017 NHL 94 Championship in Las Vegas. He was successful in his very first world record attempt. What I appreciate about retro games is that there was a big limitation when creating them: the challenge was, “make a fun game that people will want to play over and over while dealing with limited memory space, graphics and functionality”. That's what makes games from the 8 and 16-bit era, that you can still play and enjoy, so impressive.Today, the possibilities are endless: games evolve at such a fast rate. In 1985, Mario was a crowning achievement. In the foreseeable future, we could literally be playing Mario in Virtual Reality. Zelda: Breath of the Wild is just mind boggling in terms of how complete and vast it is. It has to be in the conversation of greatest video game ever made. Happy New Year ! Welcome to 2018. 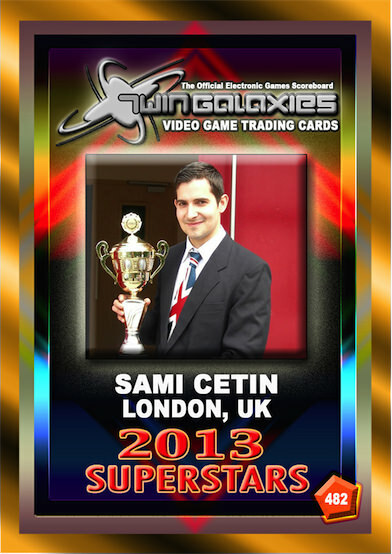 Our next Trading Card Spotlight features Sami Cetin (UK) who currently is displayed on card number 482, from the Superstars of 2013 Collection. Sami is one of the World Record Holders at Super Mario Kart SNES. In 2012 he won the World Title that was held in France. He also manages the Super Mario Kart Time Trial World Rankings since 1998 at www.mariokartplayers.com/smk/ . A collector of Nintendo games, he has over 200 boxed games among various Nintendo consoles in his collection. 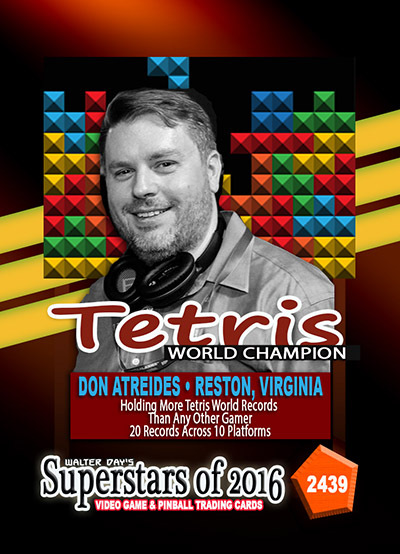 Some of his Guinness World Records include Super Mario Kart Mario Circuit 1 PAL version – 57.90 seconds & NTSC Version - 55.97 seconds. Sami has been training his niece for many years to be a Super Mario Kart Champion herself and is also among the fastest players of the World. I first got to know Walter in late 1999 / early 2000 when him and the Twin galaxies team found our Super Mario Kart community and the partner site for Mario Kart 64 and wished to link up from there to help provide additional content for any upcoming books / projects. Then I had the opportunity to meet Walter Day in person in August 2005 at Fairfield Halls, Croydon, South London, UK (near where I live). It was a retro gaming event where several of the Twin Galaxies crew were there, including Billy Mitchell, Doris Self. I also had a very nice chat with Perry Rodgers who was due to have a Galaxian Showdown then with a British Gamer, Gary Whelan. However, Gary was apparently unwell at the time and couldn't attend the event. I have been in touch with Walter since then and really hope to meet him again. I decided to go back to school and get my doctorate, so my time right now is really limited. Mostly I limit myself to games where I can play and listen to lectures at the same time. "Diablo 3" is a good one for that. When I do have extra time I'm playing "Shadow of War" and "Civilization VI. 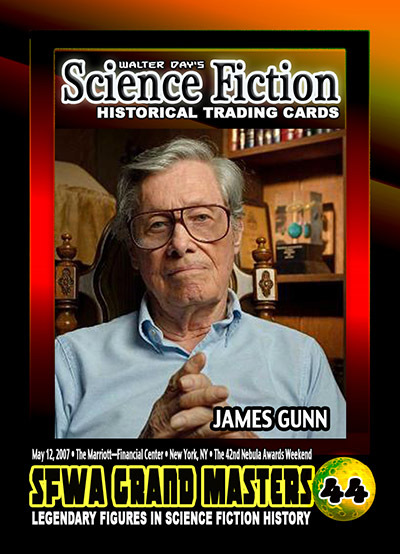 Our next Science Fiction Trading Card Spotlight Features James Gunn who is displayed on card number 44, from the Science Fiction Collection. Jim, who is a science fiction writer with many awards to his name. 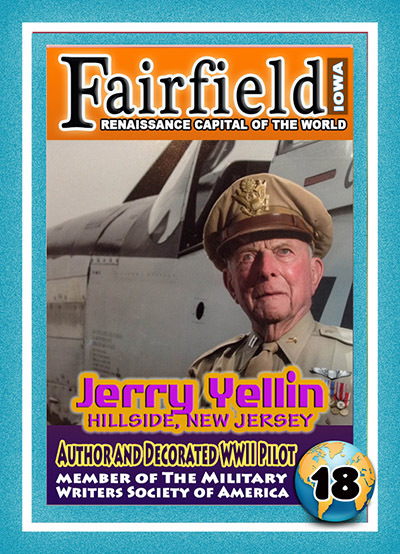 Awards that include the Pilgrim award in 1976, SFWA Grand Master Award in 2007, along with being inducted into the Science Fiction Hall of Fame in 2015. Jim also received an award for the book “ALTERNATE WORLDS: THE ILLUSTRATED HISTORY OF SCIENCE FICTION”, from the 1976 WorldCon before WorldCons began awarding Hugos to non-fiction. An updated edition of ALTERNATE WORLDS is scheduled for publication next spring. His teaching has produced several generations of writers and teachers. Jim is retired as a Professor of English at the University of Kansas, where he earned two degrees in 1947 and 1951. Jim’s autobiography, “STAR-BEGOTTEN”, was published a couple of months ago. The third volume of his TRANSCENDENTAL trilogy, TRANSFORMATION, was published in June. What it has always taken—a love of language, stories that demand to be told, determination to get it right and then get it published, and a burning desire to keep improving. I used to tell students that the first thing a writer has to learn is who he or she is and then how to put that knowledge, that unique perception of the world into stories that only the author can write. If the writer can do that he or she will be published. If their unique vision of the world happens to appeal to enough readers, they may even be successful.